420 Commercial Street is a “quintessential home and cottage” in the near East End. It is a two family property with a total of six bedrooms and and 3,015 square feet. It is being marketed for $2.2M. 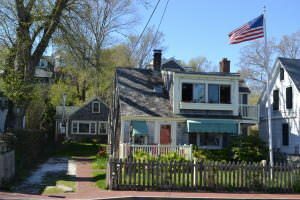 MLS Remarks: Rare and extraordinary opportunity to own this quintessential home & cottage located in the heart of Provincetown next to the renowned Packard Gallery. This intriguing home with distinctive and unique appeal was once operated as a bed and breakfast. This property offers endless possibilities…could be used as a family compound or vacation/investment property. The main house offers 4 bedrooms, a loft with 2177 sq. ft. of living space. Imagine enjoying the ocean views and downtown activity from your juliet balcony off the master bedroom. A second kitchen leads to a deck on the second floor and the loft area. The 838 sq. ft. 2 bedroom cottage is producing great year round rental income. Parking for 3 cars tandem style is a huge plus! Steps to the beach, shopping & dining. A true Gem! Listing courtesy of William Raveis Real Estate.